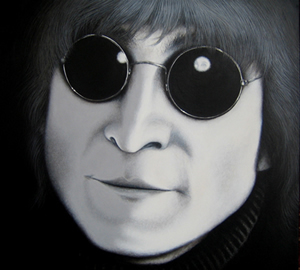 This loving portrait of John Lennon, was inspired by Allan Tannenbaum photographs, taken during the last weeks of John's life. Michael's presentation of John recalls the way a lot of us first saw him, on the Meet the Beatles album cover. Also of note: upon closer inspection one will find some fine subliminal work in John's sunglasses. We are happy to share the news that the first edition of John Lennon is now closed.